Graham Fenton, former Pools boss Martin Scott and Lee Picton celebrate South Shields' clean sweep of trophies last season. Lee Picton says his South Shields history-makers have a ‘free hit’ in tomorrow’s crunch FA Cup tie against Hartlepool United. 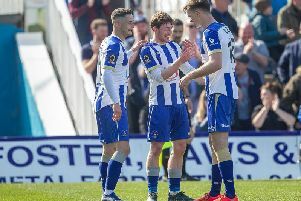 Shields will try to bridge a gap of three divisions as they take on National League outfit Pools in the final qualifying round of the competition. They have already dumped out National League North duo Darlington and York City, and joint manager Picton has his sights trained on making it a remarkable hat-trick at a sold-out Mariners Park. He said: “We almost had a free hit against Darlington and York City in the last two rounds, and it’s the same again on Saturday. “We’ve definitely got no pressure on us. “They are three divisions higher than us, and you can’t get away from that. “On paper, they should win the game comfortably, but we’re certainly not planning on that happening. Picton and fellow joint manager Graham Fenton put the Shields players through their paces in their last training session before Saturday’s big match last night. A crowd of about 2,900 is expected to pack into Mariners Park for the game. Picton believes a fast start to get the home supporters fully behind the team could be key against Craig Harrison’s side. He added: “Getting the crowd on our side is a big thing for us, and might just throw them a little bit. I think they will come into the game feeling a little bit anxious and not sure of what to expect. “If we can take them out of their comfort zone, that could gain us the upper hand psychologically and we’ll be able to take it from there. “We’ll be doing everything that we can, and now we’ve prepared the players, it’s over to them to mentally get themselves to the place they need to be to perform at their optimum level on Saturday.